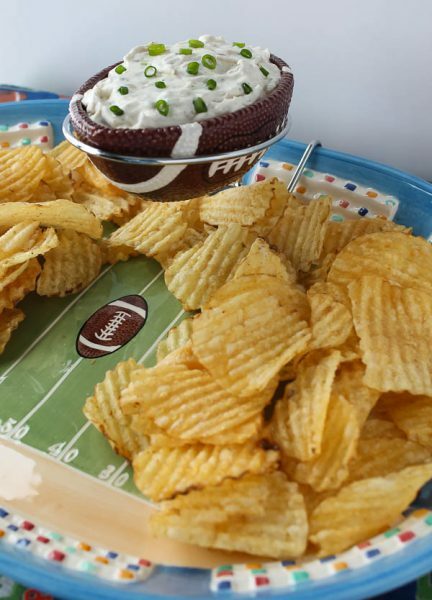 No matter if you are cheering for the Rams or the Patriots, chips and dips always seem to be on the munchie menu for the Super Bowl. Onion Dip is classic and easy, and once you taste this one, never again will you want to buy a prepared dip. The taste difference is crazy good. I found this cute stadium bowl at a thrift store, with its own little football to hold a dip. It’s always been a hit on our Super Bowl days. 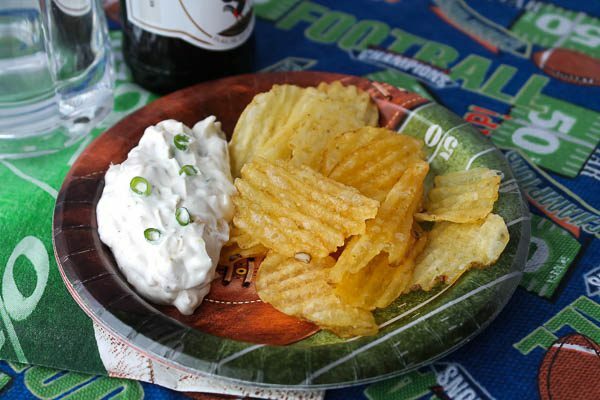 Any kind of chip is good for dipping, and veggies are great too. 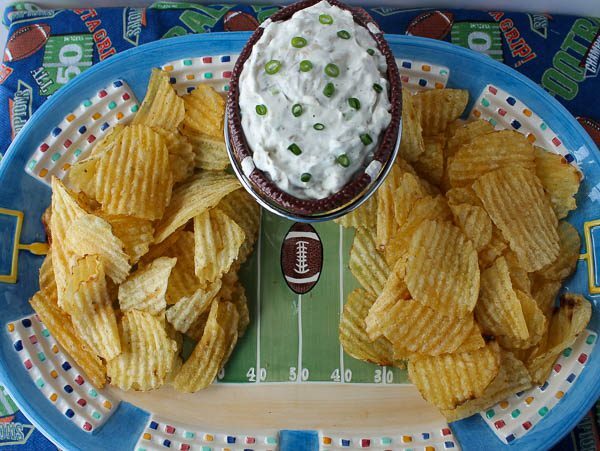 The dip is easy to make and can be made ahead until kick-off. All you do is mix a block of cream cheese with some sour cream, then add chopped onions sautéed in a little olive oil, season with salt and pepper, and add some green onions last. Cover and refrigerate at least 30 minutes to blend the flavors, or make even a day ahead. Enjoy the game, enjoy all the good food, and I hope your favorite team wins! Place softened cream cheese and sour cream in bowl of electric mixer. Mix until blended. Heat the olive oil in a skillet over medium heat and add chopped onions, salt, and pepper. Cook, stirring frequently, until onion is soft but not browned, about 6 minutes. Remove from heat and cool. Stir cooled onion into cream cheese mixture along with the green onion. Mix well. Transfer to a bowl, cover and refrigerate at least 30 minutes before serving to blend flavors. Can be made a day ahead, if desired. Serve dip with potato chips or other favorite chips, or with fresh veggies, or crackers. Makes about 2 cups. Love it, and the festive serving dish, too. Love that it is simple with all fresh ingredients. No packaged dip with all the added chemicals. Will definitely make it. Thanks, Kim! I think you will like it!